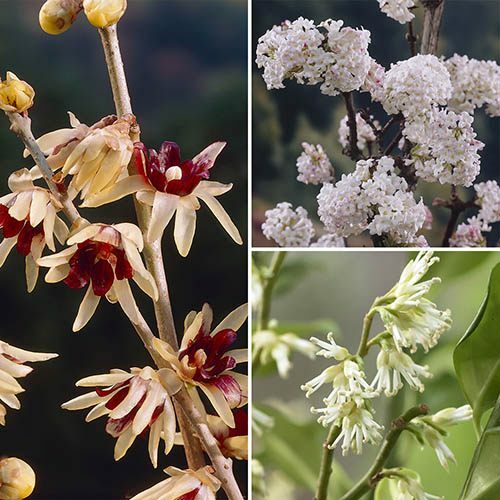 Includes creamy white Sarcococca 'Christmas Box' and Viburnum 'Charles Lamont' which is rose pink, completed by Chimonanthus praecox (Wintersweet), with bold & bright yellow flowers. Supplied as established plants in 9cm pots, 20cm tall, dormant in winter, so no leaves on then. Viburnum bodnantense 'Chales Lamont' - very scented pale rose pink flowers emerge on bare stems from November to March on this larger easy shrub. Reaches 2M tall x 2M spread. Chimonanthus praecox (Wintersweet) - beautiful sulphur yellow flowers, with central burgundy detailing, borne on bare stems Jnauary to March on established plants - reaches 2.5M tall x 2.5M spread. All are very tough and hardy, and easy care, perfect for sunny bright mixed shrub borders. or grow them in larger pots, so you can bring them close to the house in Winter flower, so you can enjoy their delightful fragrance to the max. Supplied as a colleciton of 3 named shrubs in 9cvm pots, c. 15-25cm tall each. Maybe dormant in Winter so no leaves on.